I was at a bridal shower today for my youngest daughter and her fiancé. I am so happy for them, but it's kind of breaking my heart at the same time. It's funny, but not so funny how fast time goes by the older you get. It seems like it was just last year that she started kindergarten. Wasn't it just last week that she got her driver's license? How is it even possible that Abby is 27 years old, a college graduate, an amazing first grade teacher and someone's fiancé???? This time thing is just not right and certainly not fair. Come July 18, all four of my girls will be married. If I close my eyes, I can still hear them as little girls. The giggles, the whispers, the yelling, the sweet little voices. How did they get so grown up? Nobody okayed this with me. I watched with such love and pride when my husband walked the first three girls down the aisle. There is something different this time. It's the baby. It's the last time I will see one of my daughters walk down the aisle on her handsome father's arm. It's the last time I will see that look on his face. That special mix of love, pride and just a hint of sadness. My girls are all daddy's girls. Always have been, always will be and he eats it up. They have such a special bond. It just doesn't seem possible that time has gone by so fast. Or that the time went so fast writing this week. 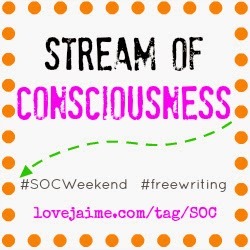 Stop over at Jaime's and check out all the #SOC posts and join in, if you'd like. It's really fun. I'm definitely having some of those same feelings with my niece, who just turned 11. Can't imagine from your perspective.